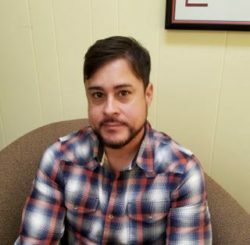 Justin is a licensed Marriage and Family therapist in the state of Oregon with experience in a myriad of clinical settings. His background is in Interpersonal Neurobiology of Attachment, which focuses on how experiences and significant relationships influence how we react to internal cues and interpret the world. He feels this integrates with Narrative Therapy in that the story of our lives that circulates within our minds greatly impacts the essence of thoughts and emotions. Justin also draws upon Rogerian concepts to create a comfortable and authentic environment for open communication. Justin also has a background in trauma informed therapy and has worked with teenagers and young adults in high intensity outpatient programs focusing on issues related to significant depression, anxiety and impactful traumas. “Since I was young my grandparents would talk about struggles and epic life adventures which profoundly impacted the way I envisioned the world. I think that we are always telling stories, in our minds, about who we are and what is valuable to us. If we can learn to perceive our journey in a new or different way it can lead to an improved sense of self and our role within this life.” Justin enjoys family, music, reading books and watching documentaries in his spare time.